Managing all your users is a hard job. 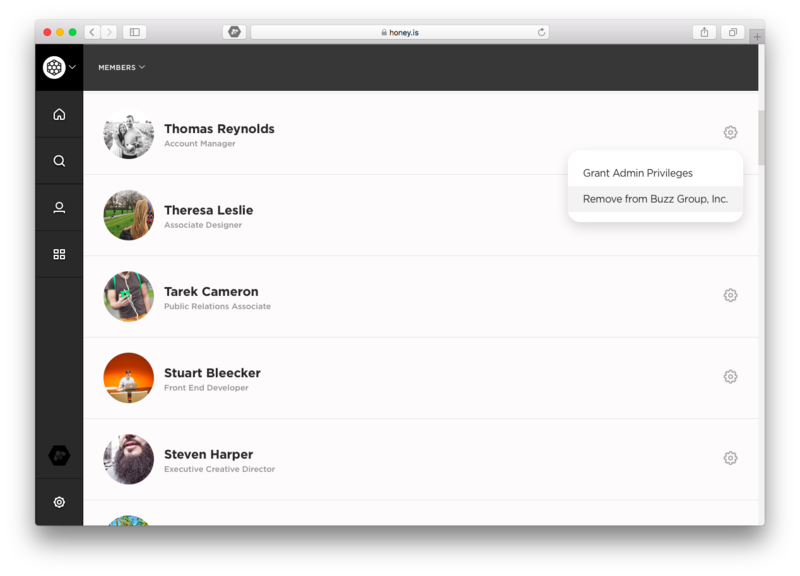 That's why we've made it easy to add, remove, and organize all of your users. Here's how. 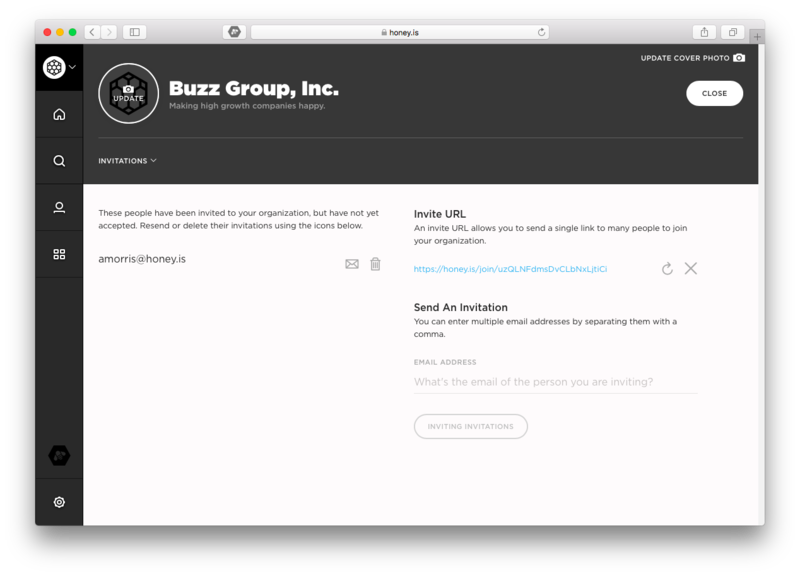 There are a number of ways you can invite your team members to Honey. Take a peek at the options below and use the invite method that works best for you. Click Invitations in the page header. Then, in the Send an Invitation section, type in the email address of the team member you'd like to invite and click Send Invitations. You can also manage pending email invitations. If you'd like to resend a pending invitation, simply click the envelope icon next to the name of the invitee you'd whom you'd like to resend an invite. In the Invite URL section, click the Generate Invite URL button. Then, copy and paste the URL to the team members you'd like to invite. Upon clicking the link, they'll be taken through the steps to set up their account. Once created, you can also manage your invite link as needed. Click the X button to disabled your existing invite URL or click the refresh button to generate a new invite URL, thereby disabling the your existing invite URL. Click Members in the page header. Locate the user you would like to remove from Honey. Click the gear icon next to their photo and select Remove from Honey. This will remove the user from Honey and revoke their access to the entire organization. When a user is removed from Honey, their profile is removed from the people page. All of their posts, comments, and likes will remain intact. Guest users are Honey users that have only been invited to a specific group within your organization. They do not have access to the entire organization's content—organization page, people page, group page. To invite a guest user. Visit the group to which you'd like to invite your guest user. If you haven't already, join the group by clicking Join Group in the page header. Then, click the Invite button in the page header and type in the email address of the team member you'd like to invite and click Invite. To remove your guest user. Click Guests in the page header. Locate the user you would like to remove from Honey. Click the trash can icon to remove guest users. They will be completely removed from all groups of which they are currently a member and will no longer have access to any content within your organization. To promote your guest user to an organization-wide user. Click Guests in the page header. Locate the user you would like to promote from Honey. Click the + to promote guests to full organization users. They will be granted access to all public content within your organization. Please note, guest users occupy a seat on your Honey license just like your organization-wide users. If you'd like to invite guest users, but would like to talk through best practices to ensure your organization-wide content isn't accessible to your guests, please don't hesitate to reach out to our Customer Support team. We'd be happy to help.